Yes I use some wee cases similar to that - do the job well. Fasttech usually very good with product and shipping. The deer held well in the night last night or should I say this morning. Very calm .The Hilux had a fatty on the dog box as it headed back up north. Using 55gr Barnes tsx. All deer neck shot and dropped like an anchor. Man it is impressive to watch in the light.No prisoners that pill.Old work boss of my son text earlier in week asking for some venison.Skinned, packaged and delivered late this morning. Having family function so very happy. Just a comment here - there is a new Maxtoch torch called Xsword being advertised on trademe at round $500. Just be aware the M24 and 2X are much better for hunting than this new light. 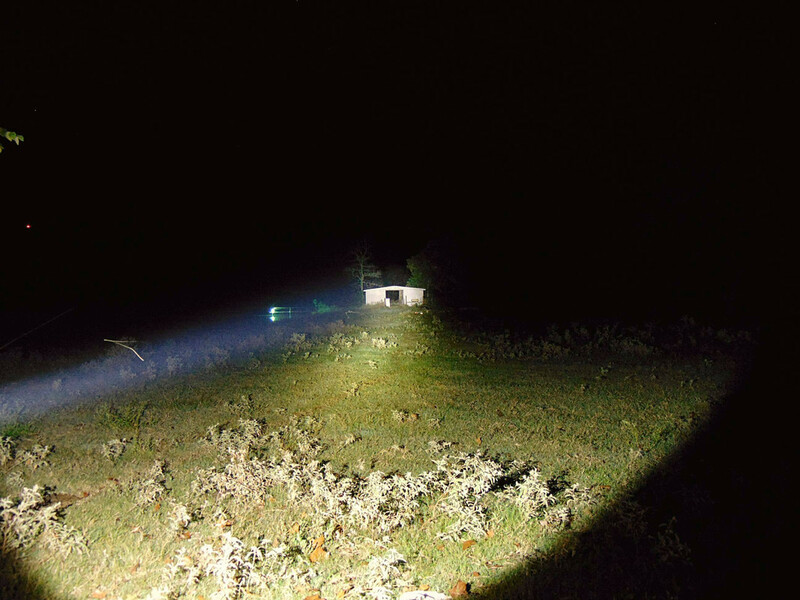 We've tested this light - it has an extremely thin beam using laser diode, and has zero spill to scan terrain. Has 2km range but not really a hunting light. We keep a close eye on new torches round the planet and 2X and M24 still the best all-purpose hunter lights you can buy. Appreciate your work mudgripz,sako has a Maxtoch under his pillow that he fondles in his sleep.Any suggestions for a short torch that i can hang of knife belt or lanyard round neck.After a circle of light forward so i can glance down and see where to step.Thanks. Our last deer was dead before the thermal boys could get their thumb out of their mouth.If you have 2/3 crew the Maxi is lethal.Yes T3 and DPT are our other silent partners. Ask them if they have holsters - if not I might have one here somewhere. Mike- can you plz explain all those "mode group" options. It's all Chinglish to me.. I suspect it's a Mode 3 I want- only full noise else 10% for walking along?? DEf don't want strobe. Yeah confused me too. I've sent Convoy an email asking which option is simplest i.e. just lo/med/hi. We don't need lots of short switch press (3 seconds), long press (10 seconds ot whatever) to access different mode banks etc to confuse us when walking/hunting. Hopefully get an answer shortly. Hello Chris et al - for the little Convoy C8 torch you choose XML2-U2-1A led, and then choose the "7135X8 mode option 2" box for simple lo/med/high switch. Cool - let us know what this little Convoy C8 is like if you buy one. The one thing that could be better with the Convoy's XML2-U2-1A led option is its very high colour temperature at 6500-7000K or Kelvin. Measurement on the Kelvin scale measures a light's temperature or tint. A high Kelvin temperature torch = extremely bright white with bluey tint which glares alot and washes out natural colour. Ideally we use about 4500-5000K for hunting which is warmer, more towards old halogen tint, and gives much better object picture (CRI or Colour Rendition Index) down range. Dedoming a 6500K torch will often drop it down to the warmer 4500-5000Kelvin - and this is what we've done to get the warmer, more natural beam for the M24 and 2X. The Convoy C8 does come in other leds eg XML T6 but that's an older led, and the XPL HI is less efficient - requiring alot higher current for output which makes it run hotter and need stepdowns to lower mode after few minutes. XML2-U2-1A still the best deal for it, and even at 6500-7000K it will be fine for pottering round/walking etc. Same for me , Mudgripz soon put me right on these .I hate waste so I am now trying to figure out a way to use them , maybe as an electric candle . I have a cuzzy in the electronics game so I am getting him to have a look at the problem . The Convoy C8 that you are speaking of is a good all around torch. I have had several that I gave away as gifts and still have 2 of them I kept. The XM-L2 U4 1A when dedomed in these lights gives you pretty much an identical tint to the factory dedomed 2X and M24 lights. Unless you do some modding and use a FET driver or something like that , the XP-L HI gives pretty close to the same output on these particular lights with only a very slight decrease in runtime with the stock driver that you (Muddy) mentioned above. Personally I really like the XP-L HI V3 3C emitter for the C8 as it gives a really good tint for hunting or general use. If you are wanting more from the C8 they are pretty easy to take apart and the mods are simple on these. The FET driver in place of the stock driver will give you about 4.5 to 4.7 amps at the tail using the dedomed XM-L2 U4 1A with about 1250 to 1275 lumens OTF. The thing with the C8 when using a XP-L HI you don't get the big amperage jump as we had in the 2X between the two emitters and usually about 1 amp more is what the HI emitter will pull and that will give you about 1350 to 1400 lumens OTF. Also if a FET driver is used such as the ones I usually get I have 5 modes from starting in Moon / L / M / H / Turbo and NO blinking modes at all. the High mode is usually plenty for general use such as walking or even shooting out to 100 meters or so and then only use the Turbo for distances further out up to around 375 meters. 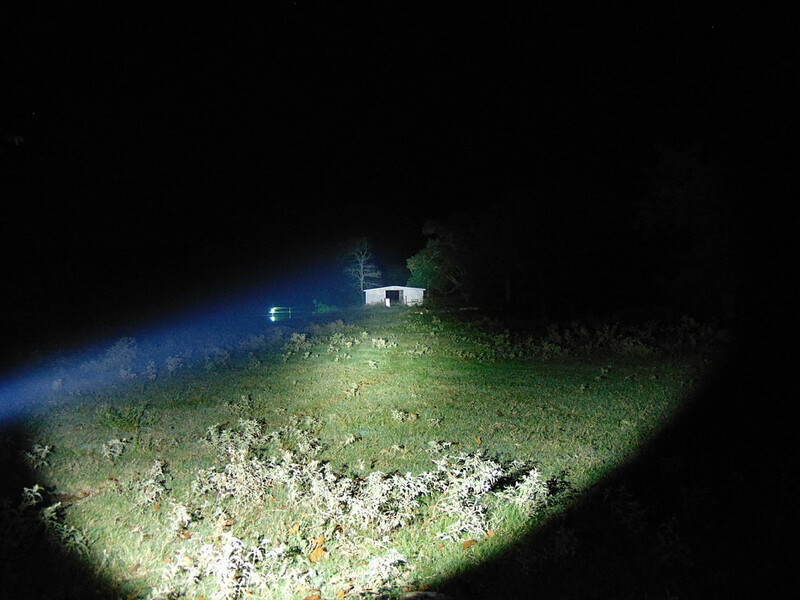 Here is what the tint of the XP-L HI V3 3C looks like compared to the Acebeam L16 with the 5700-6000K tint in it , from 137 meters to the front of the barn. My 2X just grins when someone talks about a competing torch.